on the banks of the pretty lake of Ullswater have really just about thought of everything you could possibly wish for, for a fabulous camping holiday. Whether you want to bring your own tent, maybe your own tent but a pitch with an electricity point? Touring caravans, motor homes to self catering lodges. The campsite has its own beach in addition and launch facilities; they have on site pony trekking, adventure playgrounds - two! Tennis courts, mountain bike hire addition to a club house with a pool table, table tennis, WiFi and Video Games plus of course fantastic scenery and walks from your tent door. If you fancy a complete break why not dine at their licensed bar and restaurant? Take aways are also available - even for breakfast! Full details of all their facilities can be found here. Grade description: A short walk on level ground going at a leisurely pace. Usually suitable for pushchairs (may need to lift over small obstructions). Just turn up: Arrive early to avoid disappointment. Self catering cottages in Glenridding are perfect for those who want to walk from the door of their cottage, without being remote. The Ullswater Steamer is a fabulous treat for all ages, not just for the kids and is a brilliant way to start or end your walk without having to use your car. 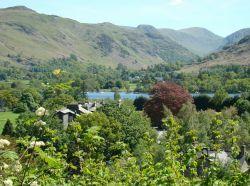 Read more about these self-catering cottages in Glenridding and surrounding villages. Walk straight from the tent door! Set at the foot of the fells of Helvellyn the Gillside Farm Campsite is well equipped with hot showers, dish washing facilities and a laundry. Static Caravans are also available for hire. Read more here. Looking for a cross between camping and Youth Hostelling? Superbly located at the foot of Helvellyn is the Glenridding Bunk House. Twenty bunks in two rooms. 13+7. Basic Electric Kitchen. For more information and to check availability contact Gillside Bunkhouse directly. As I'm sure you are aware, weather changes very rapidly in Cumbria. You can risk heat-stroke one day and high winds and torrential rain the next. Please play safe and check the noticeboard at the Glenridding tourist information office (just off the car-park) which displays an up-to-date local weather forecast. Staying in Glenridding allows you to get an early start to tackle one of Cumbria's loved mountain ranges and hopefully beat the crowds. A short steep pull will find you at the top of one of the nobbly hillocks such as Glenridding Dodd and Sheffield Pike. The views from which are tremendous and perfect for those who want a shorter walk but still want to feel that they have stretched their calf muscles. Why not plan to get to the top in time to see the sunrise or for a family picnic? During the summer months it is possible to take the Ullswater lake steamer to Howtown and then make your way back to Glenridding over the fells. If you are looking to soak in the scenry without taking to the hills then Glenridding and Lake Ullswater may just be your perfect location. Stroll just past the boundary of Glenridding in the direction of Penrith and you will find several benches dotted along the shoreline overlooking Lake Ullswater. For a longer walk, without too much climbing, why not combine a cruise on the majestic Ullswater Steamer to Howtown and then follow the shoreline path back to Glenridding. The choices are endless. There are several benches strategically placed along the side of Ullswater, perfect for those who want to enjoy the view...a great place to picnic or enjoy the evening sun. 18th century inn some outdoor tables. Traditional pub food with a walkers bar atmosphere. Huge portions - the fish and chips are fab! If you are staying south of Glenridding or don't mind hopping in your car; the White Lion Inn at Patterdale, has a good reputation for sizzling steaks and real ales and is steeped in history. Delightful, food and good Coffee in Glenridding. This Ullswater restaurant is a cafe during the day, turned restaurant early evening. Literally just steps from the Glenridding village car park, Fellbites is one of Glenridding's best kept secrets. The mouthwatering dishes, are often sourced from local produce and can be accompanied by a glass of wine, or a Jennings or Coniston beer. The Glenridding Mini-market does a fabulous trade in ice-creams - very welcome, as is the wall to sit on by the stream, very relaxing after the walk back from the fells. For those last minute must-haves there is a Walking/Hiking shop which on a hot day does a roaring trade in Camel-Paks. With lawns stretching down to the edge of Lake Ullswater the Leeming House Hotel is a great place spot for afternoon tea on a glorious afternoon. Guests staying at Leeming House can enjoy the Hotel's private fishing licence, or just enjoy the splendour of this 200 year old House, set in 22 acres. If you want to make a dramatic entrance to the hotel, then talk to staff their about use of the heli-pad. Wondering what it costs? Check out today's best rates at the Leeming House Hotel. 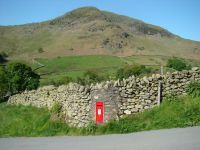 The Helvellyn Youth Hostel is 0.75 miles from the village of Glenridding. It is one of the YHA's more isolated hostels and is 900ft above sea level. Ideally situated for walks up Helvellyn. The Patterdale Youth Hostel is set amongst stunning scenery and suitable for kids over 5. There is often impromptu music in the common room. Aira Force - Ullswater is literally just a few minutes drive out of Glenridding towards Penrith. There is a large pay and display car park, public loos and during peak visiting times a tea room. This is a very popular waterfall walk so if you want to avoid the crowds try to get there early. Alternatively why not enjoy as an after dinner walk on those days when the weather suddenly improves at the end of the day? Ride to the top of Helvellyn on horse back with experienced guides.